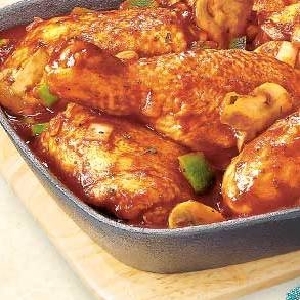 Enjoy this easy chicken cacciatore recipe, made with onion, green pepper, stewed tomatoes, wine, and oregano. Brown the chicken with garlic, onion, and lemon juice in a small saucepan. Deglaze the pan with the chicken broth. Add tomatoes, tomato paste, vinegar and spices. Simmer on low heat for 20 minutes stirring occasionally. Remove the bay leaf and serve hot.